The USB external sound adapter is a highly flexible audio interface which can be used for PS4, desktop and laptop. 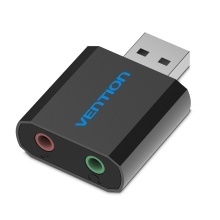 The sound card is USB-powered, so there is no external power required, no drivers required, plug and play. It can be plug and pull for ten thousand times, giving long service life to you. Built-in high-quality chip, it can clearly deliver sound to you and no noise when you use it. USB to mic & speaker adapter solves the problem that the notebook only has a headphone port so that the microphone plug cannot be inserted.